Here’s what’s happening in the world of television for Sunday, December 3. All times are Eastern. I’m so glad we had this time together, just to have a laugh or sing a song. The Carol Burnett 50th Anniversary Special (CBS, 8 p.m.): If you are of a certain age, you grew up watching The Carol Burnett Show every Saturday night; if you are younger, you should definitely check this special out to learn about a master at work. The Carol Burnett Show helped kick off the 1970s variety show era when it debuted 50 years ago in 1967, and was one of the few to feature a female comedian at the helm. 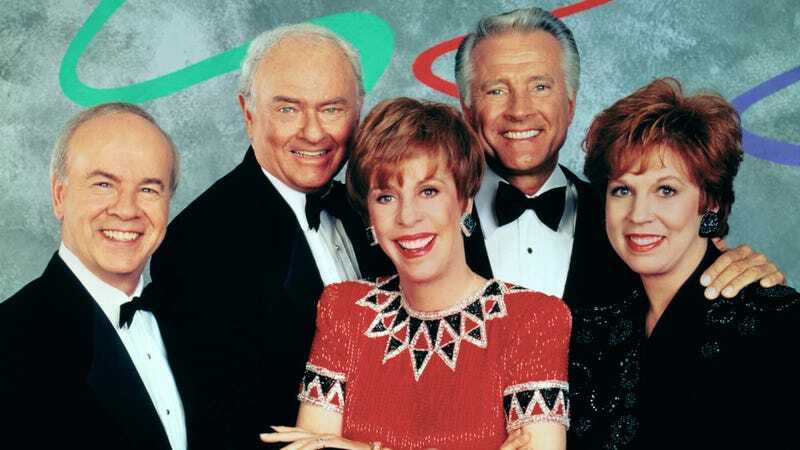 Comic genius Burnett wisely surrounded herself with gifted performers like Vicki Lawrence, Harvey Korman, and Tim Conway—sure they cracked up a lot mid-skit, but faced with that kind of hilarity, who could blame them? Take advantage of this rare opportunity to spend a few hours with the delightful Carol and crew. Guests include original cast members Lawrence and Lyle Waggoner, costume designer Bob Mackie, and Carol admirers and friends like Jim Carrey, Kristin Chenoweth, Stephen Colbert, Bill Hader, Jane Lynch, Maya Rudolph, and Martin Short. Marvel’s Avengers: Secret Wars (Disney XD, 8:30 a.m.): Speaking of women we miss seeing on the small screen, we’re still fired up about the unfair cancellation of Marvel’s Agent Carter. Fortunately, the beloved heroine returns to the Avengers fold this weekend in an animated Secret Wars episode, with Hayley Atwell herself voicing the character. Sure, you’re all excited about the Avengers: Infinity Wars trailer, but the movie doesn’t come out until next spring. So for your current Avengers fix, this appears to be an excellent week to check out this Disney XD series: “Past and present collide as Howard Stark and Peggy Carter team up with Iron Man and Captain America to save the time stream from Kang The Conqueror.” Howard Stark, too? We’re in.